North Shields fans have fond memories of their fantastic night at St James’ Park in May when they overcame all the odds to beat Blyth Spartans 4-3 in the Northumberland Senior Cup final. Their defence of the trophy began on Wednesday evening with a comprehensive 3-0 win over Heaton Stannington at the Daren Persson Stadium. 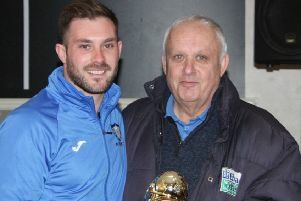 Proud skipper Kevin Hughes held the Senior Cup aloft back in May and he was named on the bench this time alongside late match-winner Ryan Carr, whilst double goalscorer Gareth Bainbridge was unavailable. But the player who scored the opener on that night against Blyth, and who provides the engine room in midfield,Gary Ormston, was again in the starting 11. Also making his debut was defender Craig McFarlane, who signed in the summer from Whitley Bay but who has been sidelined through injury. Shields faced a tricky tie in their defence of the trophy against mid-table second division side Heaton Stannington, who made the short journey along the Coast Road. But 13 minutes in the hosts were ahead as Curtis Coppen deftly headed home a corner. Dan Wilson, Lee Mason and Denver Morris all tested Matt Smith in the visitors goal as they clung on. It certainly was not all one-way traffic with lively Heaton striker Dan Robinson screwing one effort just past the post then only thwarted by a brave clearance from Kyle Hayes as the forward raced goalwards. Heaton, though, were overcome after the break by the Robins’ pace once sub Bobby Taylor buried a short free kick past the hour mark. Dazzling speed from Morris then took him to the by-line where Dean Holmes was lurking to smartly flick home for number three against his former club. Just how the plucky visitors did not concede more was largely due to heroics from Smith, though, he could only look on as another Coppen header struck the bar. North Shields: Hayes, McFarlane (Donnison 75), Summerly, McKeown, Parker, Coppen, Morris, Ormston, Wilson (Taylor 62), Mason, Holmes (Carr 75). Subs not used: Hughes, Lancaster. Meanwhile North Shields forward Jack Devlin has signed for Newcastle Benfield. The player said he was looking to play on a regular basis, but added that he has had a great time with the Robins. The club said they wished the player, who was the scorer of some spectacular goals including against his new side Benfield and a hat-trick at Washington, well.